I'm baaaaaack! And I'm better than ever. You get the picture. Surprisingly enough I realized that with a short 24 hours in a day I am only capable of doing so much. And with 4 children who want to eat every single day and demand clean underwear at least twice a week, something had to give. So I stepped away from my beloved blogging to try and maintain a grasp on the chaos I still had left. But the blogging gal inside of me never shut down. Every time I would learn something new or make an epic fail or try a fantastic new photo product I would be thinking in my brain about how I would love to share my thoughts with the world. So here I am back in the blogging world with an overload of random thoughts spilling onto the page. I warn you, it may get messy. I've experienced sooooo much since last fall in photography and business and everything in between and I just can't wait to share it with you. Every experience is just swirling around in my brain and I can't quite seem to sort it all out yet. You ever get like that? ~ Facebook is an evil necessity to me. Necessity because it's the only place I can reach tons of people with my photography for free. Evil because it breeds insecurity and doubt when browsing other photography pages and comparing to my own work. ~ Getting the shot right "in camera" beats fixing in photoshop any day. ~ I'm a sucker for templates. I stink at graphic design so I bought a ton of templates last year to have plenty of options for products. I need to control myself. ~ Even though I stink at design, I wish I could create new marketing products every day. I love the creative outlet it provides and I really love showing off all the awesome people I get to photograph. ~ Shooting with the end result in mind has completely changed my photography habits. I'll talk more about all those things later. I hope you stick around for it. One thing that hasn't changed...I still love textures. Always and forever. 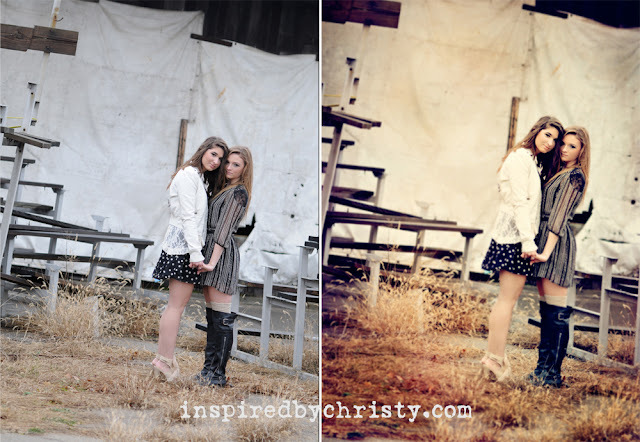 Here's a lovely B&A with 2 lovely sisters/singers, showing how I enhanced their photo with just a few lovely textures. Aren't they lovely? I'm glad you're back blogging, though I do check in on your FB (which I find evil just because it will not let you go once in its grasp!) What a difference in the pic of the sisters! Love how the textures warmed up the pic! I'm just finding you, glad you're here! Read one of your articles on Erin's site. The sisters photo is beautiful! Can you tell me which textures you used? I liked your comment about preferring to "get it right in camera" to spending lots of time in PS. Are you shooting jpeg? Thanks so much, you inspire me!